Vizrt is a worldwide market leader in the areas of real-time 3D graphics, studio automation, sports analysis and asset management tools for the media and entertainment industry. This includes interactive and virtual solutions, animations, maps, weather, story and video editing, compositing, and multiplatform VOD and live playout tools. Vizrt’s products are used by the world’s leading media companies, including CNN, CBS, Fox, BBC, BSkyB, Sky Sports, CBS Sports, Fox Sports, Al Jazeera, NDR, ITN, ZDF, VICE, The Washington Post, TF1, CCTV, NHK and the list keeps growing. Furthermore, many world-class production houses and corporate institutions such as the London Stock Exchange use Vizrt systems. 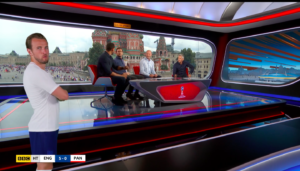 Croatian tracking specialists, stYpe are providing tracking for six cameras in the studio while the UK’s Alston Elliott (AE) were challenged to design and are operate AR graphics to compliment the broadcaster’s teams. 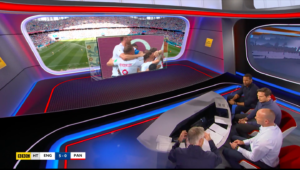 Vizrt’s Viz Engine is the workhorse behind all of the graphics rendering, including AR in the studio and virtual set extensions to hide the massive amounts of production systems in the Red Square studio.